We focus on one thing: providing the most comprehensive and most accurate information about public campgrounds of ALL types. Over 39,000 U.S. and Canada campsites and growing -- Updated monthly! 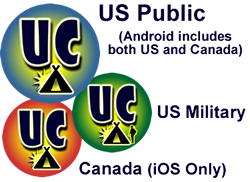 Android, iPhone, Mac ... We have many ways to get Ultimate Campgrounds on your devices! Check out our map to see the scope of our data. Interested in seeing Ultimate Campgrounds data on your GPS device?